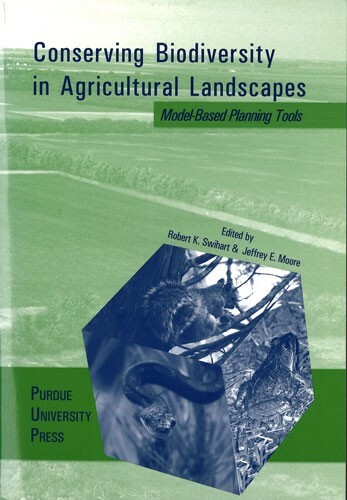 Robert K. Swihart is a professor in the Department of Forestry and Natural Resources, Purdue University, and coordinator of the Upper Wabash Ecosystem Project. His research interests include effects of human activities on wildlife behavior, population dynamics, and community structure, and the application of ecological theory to address problems in land-use planning and conservation. Rob teaches courses in vertebrate ecology and systematics, vertebrate population dynamics, quantitative methods for ecologists, and advanced mammalogy. He received a M.S. in wildlife from the University of Minnesota, a Ph.D. in ecology from the University of Kansas, and conducted postdoctoral research under a National Institutes of Health national research service award. Jeffrey E. Moore is a doctoral student in the Department of Forestry and Natural Resources, Purdue University. His research interests include mammalian and avian ecology, with an emphasis on the role of habitat fragmentation in mediating trophic interactions of granivores and seed plants. Jeff has teaching experience in wildlife ethology. He received B.S. and M.S. degrees in wildlife from University of California-Davis and Humboldt State University, respectively.